All languages within the print driver. Select Language on the Administration tab in the Printer properties dialog. In the Printer properties dialog select the Administration tab. Change Configuration from Basic Printing Mode to the model of your printer. Example: Xerox Color C70. 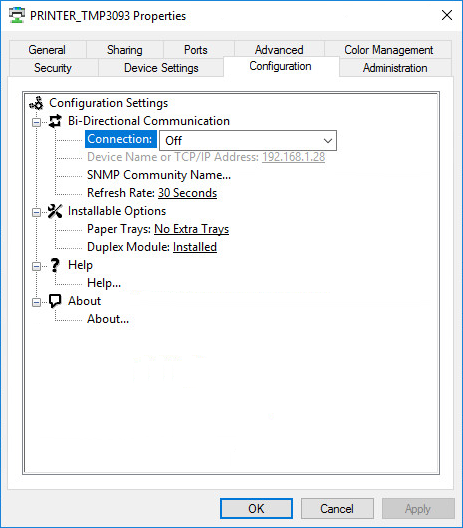 Change Connection to Off. Otherwise Windows may report: Printer Status is not available at this time. Optionally open the Administration tab change Configuration to another print mode. I'd like to share with you my experiences with the Xerox Global Print driver and our Xerox AltaLink C80XX Series printers. First of all, in a business context you'd like to have the features of the bidirectional connection e. g. to work with different kind of paper. The solution that works for us is to turn "Bi-Directional Communication" to "manual", with the right IP-Address in the field. Automatic does not work for us, because on the client it uses the local port. 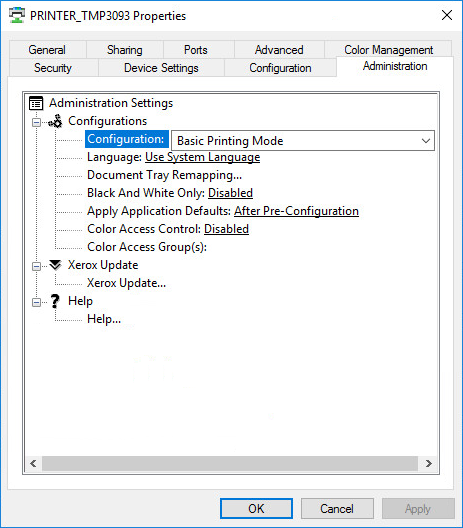 So I suggest for every administrator with Xerox Printers of the Office line or greater, set "Bi-Directional Communication" to "manual"!